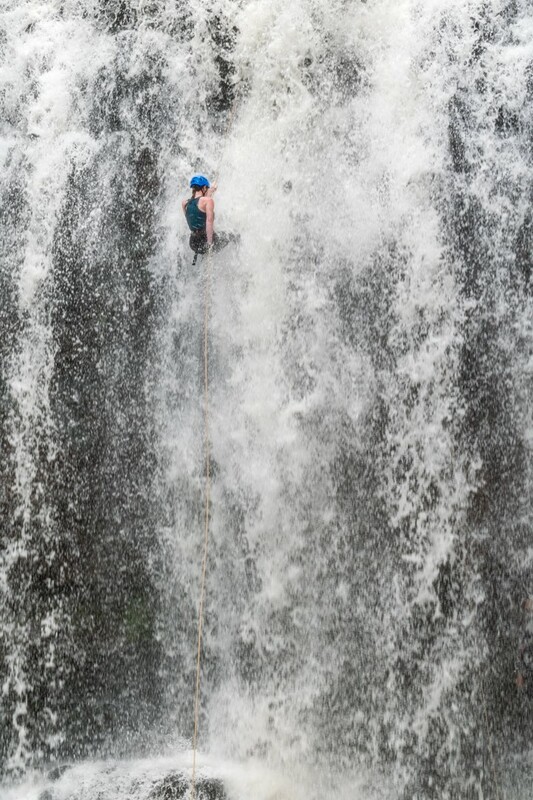 If you’re not sure what rappelling is, it’s a controlled descent down a rock face or waterfall using a rope. By deciding how much rope to let through the rappel device with your dominant hand as you walk down, you control your speed. 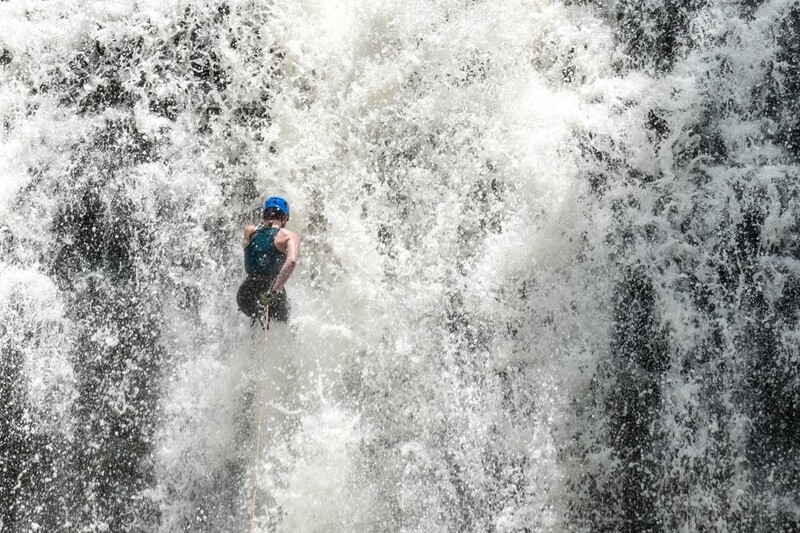 Rappelling isn’t for the faint-hearted. I was told after my rappel that a 77 year old grandma descended the same route. Perhaps it’s more of a mind over body experience. A certain level of fitness is required but not huge strength. 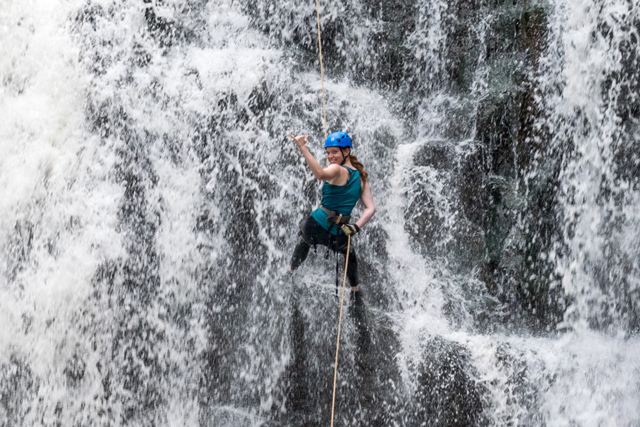 Island Adventures were the first to bring rappelling to Kauai. 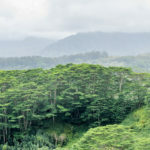 They hold the adventure on private land in the Hule’ia National Wildlife Refuge and do all the trail maintenance themselves. 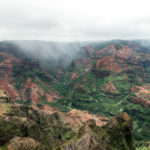 It’s clear to see they truly care about Kauai’s natural environment. They enthusiastically shared the importance of ensuring the existence of the 31 species of native birds living in the refuge. We met in the morning at Da Life Outdoor Gear in Rice St, Lihue with the crew and fellow rappellers. Quickly briefed about how the day would play out, we were each given a large waterproof bag to put our belongings in. 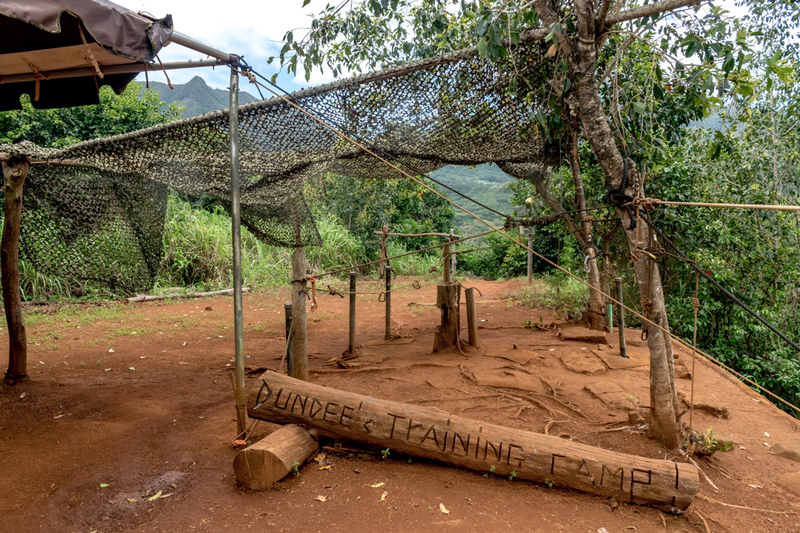 Soon after, were told to jump in the van for a short drive past the Nawiliwili Harbour and up the hill to a private residence where Dundee’s Training camp was held. I loved the work they put into this place. A communal tent draped with cargo nets made it felt like we were on the set of a movie. The killer views of the Haupu Mountain Range and Huleia Stream were a perfect backdrop to the training. 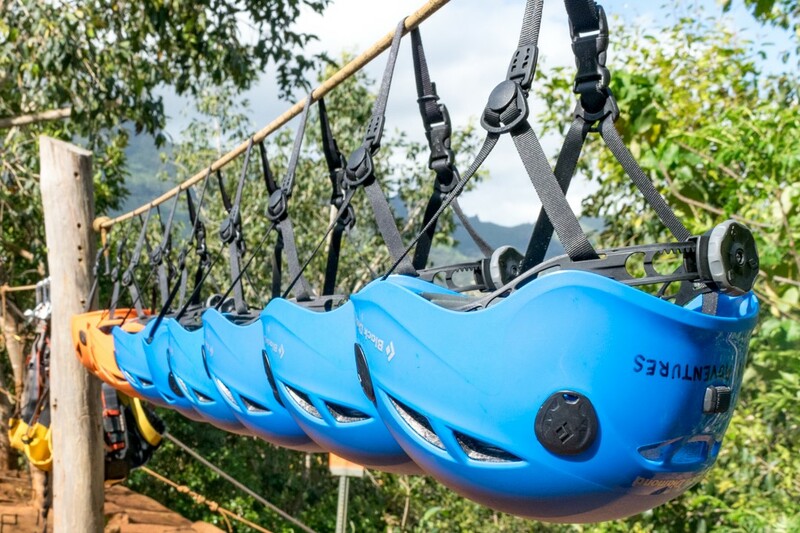 Fitted with helmets, harnesses and felt grip shoes we were kitted up ready to go. We were also given the option to utilise the provided gloves. I took this option and it was the best decision I made all day. Then came the extensive, in depth training. The team want you to have fun but safety is number one on their list. A thorough demonstration was given about the waterfall’s rock face so we knew what terrain to expect. After understanding all the instructions, we each had a guided practice descent on a dry wall to put words in to actions. Even though in theory I knew what to do, the feeling of letting myself lean backwards off a cliff edge felt so unnatural and against every instinct in my body, especially as it was 99% me controlling my descent with just one arm. The security of having the “lock” mechanism which you enforce by holding the rope behind your back, and also knowing one of the team was down the bottom watching at all times helped me feel at ease. If one of us did slip, they would apply a “fireman’s belay” by tightening the rope in a certain way to make us secure until we managed to get back on our feet. This was very useful for me later in the day. The team stressed profusely how important it was to keep the ropes in good shape. Island Adventures carry the highest quality gear and want to keep it in excellent condition to ensure our and their safety. If you’re concerned about the strength of the ropes, they can handle 6,000 pounds of weight which is about equivalent to a female Indian elephant, whilst remaining supple and easy to handle. 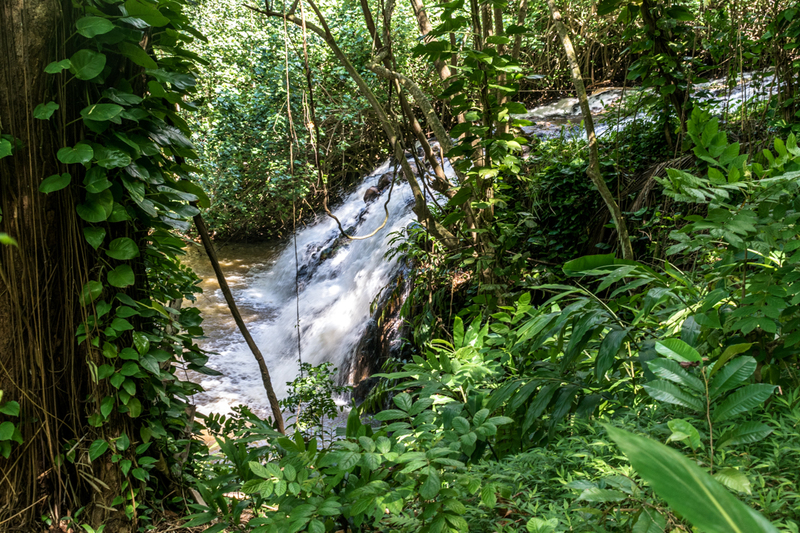 All feeling a little more confident after a trial, we walked through lush jungle down the slippery but well maintained path, past the beautiful Bamboo Falls, the 30 foot waterfall Island Adventures first started rappelling down, and we walked up to the 60 foot Papkolea Falls. I don’t think any of us realised exactly how tall 60 feet was. The white water cascaded over the rock edges and fell freely to the base, bouncing off the occasional ledge. Ladies were called upon first. We waded through the stream then uphill along the nature enclosed path. With every step I could feel my heart beating faster and louder. I really didn’t want to go first. While we were waiting for Hawaiian Dundee to do final checks, we all attached ourselves to the safety rope via our carabiners. After a few minutes of trying to calm myself, Hawaiian Dundee turned around and pointed his finger directly at me! 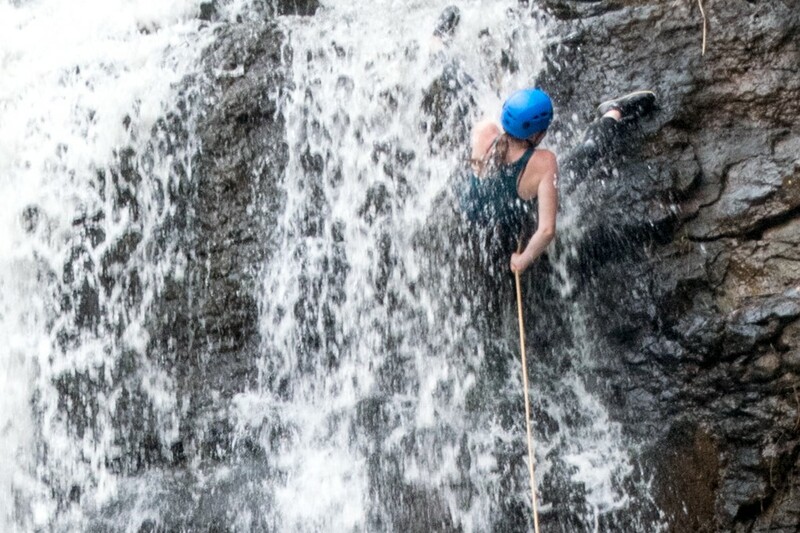 I unclipped the safety line and carefully approached the edge of the waterfall. Dundee threaded the rope through the attachment on my harness, locked me in and I was ready to go. All I had to do now… was go. “Now approach the edge, get in lock position, start lowering yourself down then take a step when you’re ready” he calmly told me. After a moment to gather my thoughts, I did just that. Step, step, lower. Step, step, lower. Before I knew it I was half way down. Hearing cheers behind me I turned around and gave my audience a shaka (a surfing hand signal for hang loose) and I was suddenly full of confidence. Making it to the bottom with ease. I was left exhilarated and full of adrenaline. But confidence soon turned to over-confidence on my second run on the next line over. At the beginning it felt the same as the first, but a few steps down the current took me by surprise and I misplaced my right root. Suddenly I was halfway to being upside down, I knew I had to get up before panic set in. With support from below, a leap and a twist I sprung up and was suddenly back on the wall. The rest of the way was taken much more cautiously. After everyone was done with their two runs, the team set up the final, and most difficult rappel. We were warned that this is an intense experience and it was more than okay if we didn’t do it. I was in two minds, I wanted to prove I could do it but I was also terrified. I let the boys go first. One of the strong young fit guys braved it and volunteered. I was watching him intensely to see how he was attempting it. He did a great job but I could tell he was struggling a little. When he reached the bottom we all gave him a big round of applause and I asked how it was. His answer didn’t make me want to try it. If he found it hard, what chance did I have? In this time a few others had climbed the trail and were ready to give it a shot. 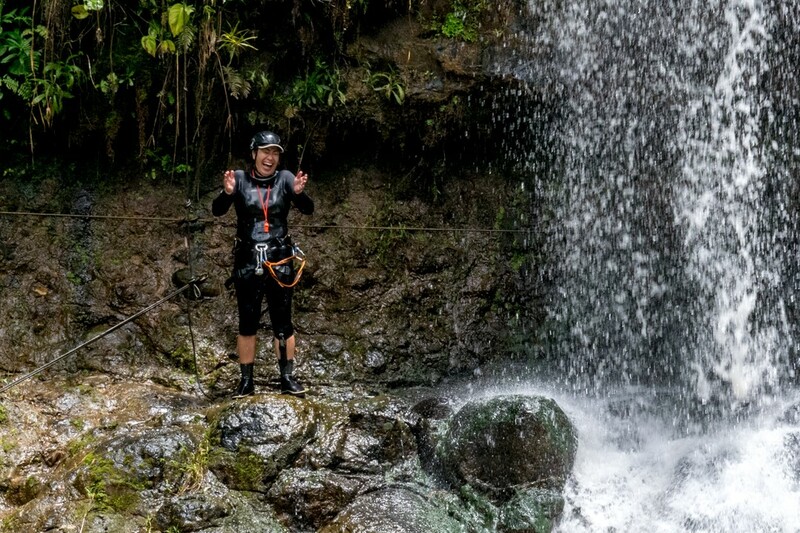 I came to Hawaii with the intention to give everything a go, despite my strong fear and natural instinct to run the other way, I began ascending the trail one by one. And well, we all know what happened next. The crew and adventurers were all rewarded afterwards with delicious sandwiches, drinks and a snack to refuel our bodies. Sitting around the tables gave us a chance to process and chat about what just happened. We also got to know a little more about the crew, their stories and Island Adventure tales. Re-energised, we headed back to the Da Life Outdoor Gear shop in Lihue and split up. Some hired surfboards from Kauai Beach Boys to hit up the surf at Kalapaki Beach, others went stand up paddle boarding. I’ll be honest, I grabbed a coffee, walked back to my accommodation and napped for an hour. It was such a fantastic day out with Island Adventures. Since the experience I’ve been raving on about it to everyone I meet. If you’re keen on thrill seeking I couldn’t highly recommend rappelling with this team enough. You’re in good hands. This is an experience I will remember for the rest of my life. 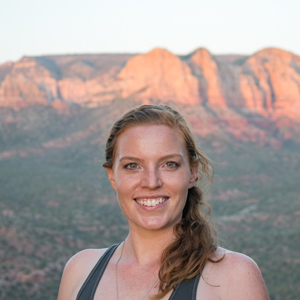 What should you bring rappelling? You will be provided with a large waterproof bag, felt water shoes, a helmet and harness, and water. 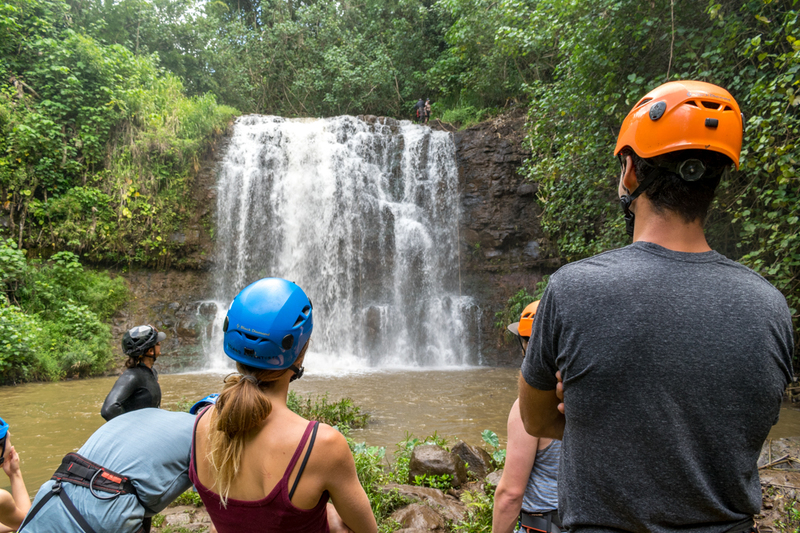 Interested in giving rappelling a go with Island Adventures Kauai? Check out their website here or on Instagram. 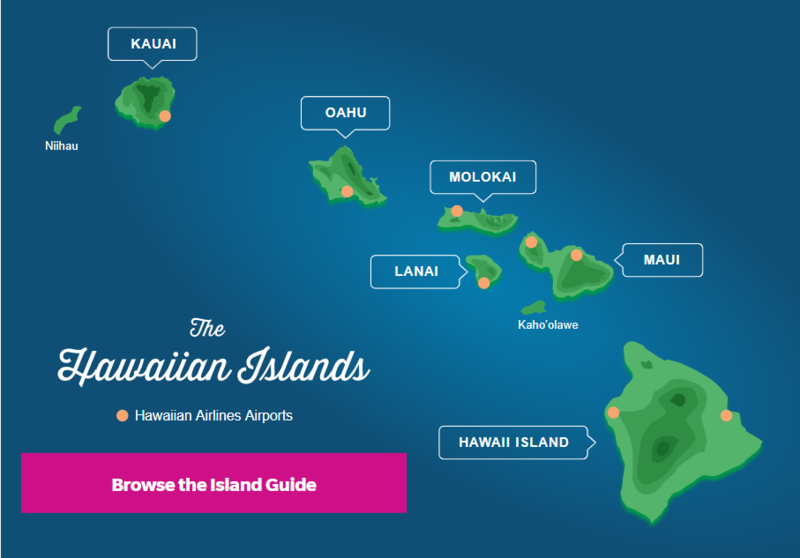 I used Hawaiian Airlines to get between islands and to mainland USA. They were great to travel with! booking.com has over 4900 properties in Hawaii including hotels, apartments, and hostels. You get free cancellation on most rooms and a best price guarantee.